Wesleyan University is a private liberal arts college, founded in 1831, and located in Middletown, CT. It is one of the nation’s most highly ranked colleges with approximately 2700 full time undergraduates and 200 graduate students, as well as more than 400 part time students. High Street, which is the old center of campus, was once described by Charles Dickens as “the handsomest street in America.” The University boasts of more than 340 buildings and, along with the historic structures, includes the recently constructed Freeman Athletic Center, the Center for Film Studies and the Usdan University Center. 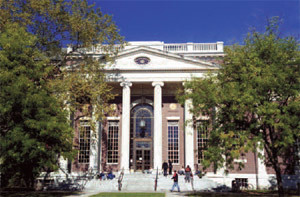 The objective of the University is twofold: the original and primary objective is to implement a key control solution within the Public Safety Department that will allow the staff to maintain better control of master keys and the keys used for high value areas including the President’s office and the Art Gallery. The companion objective is to apply the same key control solution to various additional applications (i.e. residential life, maintenance, etc.) across the campus. The Wesleyan Public Safety Department is tasked with ensuring the safety and security of the campus, including high profile areas such as the President’s office and home as well as the Art Gallery and affiliated storage areas. Only one key is issued to the Department for each of these high profile facilities and the old manual system requires the security officer to log the key in and out. Often however, keys are unaccounted for throughout the day or not returned at the end of a shift, and this necessitates individuals having to return to campus to put the key back. The log and keys are kept in the dispatch area and the office staff is continually interrupted to log keys in and out or search for keys. At the end of every day, a visual/manual check is required to ensure all keys are accounted for. Using a manual logging system, the Residential Life Staff allows keys to be accessed by certain individuals, with the necessary approvals, but only for short periods of time. It is an honor system but the keys are regularly not returned within the required time frame and the Residential Life Staff must take the time to follow up and track down the overdue keys. The concern is that duplicate keys may be made or the key could be misplaced or lost and this could result in the expensive re-keying of a building. The University needed a key control system to address and resolve these issues in a secure yet easy to use fashion and without requiring continual manual oversight. Additionally, management needed to be notified immediately if a key is not returned within the programmed parameters as well as who may have returned a damaged key. KeyWatcher® Key Control System – The KeyWatcher is a custom configured solution that meets the requirements of the University to maintain key control. It automatically records the access history of each key, including user, date and time of key access/return. The system releases assigned keys only to users with the proper authorization code (either fingerprint identification or numerical code), and cannot be manipulated or easily tampered with. The illuminated key slots make accessing and returning keys easier and the system as configured readily accommodates both hard keys and plastic key cards. KeyPro® Performance Software – The user-friendly PC application software delivers real-time polling transactions, status, alarm and reporting capabilities for the KeyWatcher system. Activity reports can be customized to trace key movements by time, date and user code or biometric access data. And because the software allows the KeyWatcher Key Control System to be conveniently accessed and programmed remotely via an IP connection, control of the keys can be more efficiently and safely managed remotely as well. Priority email alerts can be sent to management to keep them informed of the whereabouts of high security keys or if they have been accessed at odd hours. A KeyWatcher system is installed in the briefing room within the Public Safety Department at the University and houses approximately 50 one-of-a-kind keys as well as master keys. Based on the success of the Public Safety Department application, the Residential Life Department installed three KeyWatcher systems at various locations for control and management of building and room keys under their authority. Public Safety staff can still access keys as required but without disturbing other employees and without the bother of having to manually log a key out and/or in. With just a visual check, management can see which keys are out and at the end of the day all keys can accurately be accounted for. With the SmartKey secured to each individual key or ring of keys, the Residential Life staff can program the keys for the length of time they are allowed to be out and if the key is not returned within the scheduled time period, management is notified via a priority email alert. The KeyPro Performance Software generates reports which provide accurate and detailed information, such as which individuals had which keys, when they had them and for how long, etc. The KeyWatcher system has allowed the University Public Safety department to improve control and management of the keys and has removed any vulnerabilities associated with a manual logging system. The whereabouts of keys can be instantly traced and the end-of-day status report immediately identifies any non-returned keys and the individual responsible. The Residential Life KeyWatcher systems have helped to improve the safety and security of the buildings because the staff knows who has or has had keys signed out. In addition, because key control is automated, staff is notified immediately if a key is not returned within the prescribed amount of time. Learn more about key control solutions for education.